Cast: Jason Wu, Susana Tang, Sara Wiseman, Jarod Rawiri, Iaheto Ah Hi, Edwin Wright, Alix Bushnell, Michael Walley, Mark Ruka. I wasn’t sure what to expect before I watched this film. I didn’t know much about it other than it was that it was a multi-character/story drama from New Zealand. Since I’m a fan of films that have multiple/intersecting characters and stories, it definitely had me intrigued. So I sat down and put it on without even knowing what to expect. After watching it, I found it to be a really solid film. Set during one week in South Auckland in New Zealand at time of Matariki (the Maori New Year) celebrations, a terrible event has occurred. While driving home one night rugby football star Tama (Mark Ruka) spots a man and his dog getting beaten up by some drug dealers. When Tama intervenes he helps the man getaway, he gets brutally attacked by the drug dealers as well. He’s beating was so severe that it puts him into a coma. What happens next brings a chain reaction for a group of people that include Tama’s wife Megan (Sara Wiseman), a white policewoman who comes into a conflict with her husband’s Maori family over how he should be taken care of. Tama’s younger brother Rick (Jarod Rawiri) who after learning of his brother’s attack decides not to reveal his relationship with boyfriend Tyrone (Iaheto Ah Hi) to his family. As he feels that it would be much for them to deal with during this time. Aleki (Jason Wu), a young teenage thief who after stealing Tama’s abandon car after the attack, breaks into a home and meets a young Asian teenage girl who goes by the name ‘Spit’, who takes an interest in him. Lisa, a young pregnant young woman (who is due to give birth any day now), is excited that her drug addict boyfriend Jermaine (Michael Walley) is finally out of prison so that they can start their family. But when he falls back into his drug taking ways, she starts to revaluate her life and finally Gunge (Edwin Wright), the man who Tama saved and his dog from being beaten up by the drug dealers that night. The performances from the film’s cast are all very strong. Everyone was first rate with their portrayals of their characters. The stand out were definitely Sara Wiseman who was heartbreaking as Megan; she brings a lot of devastation and pain to her character that to me felt very real. Jarod Rawiri gave a wonderful turn. His character’s inner turmoil can be felt even when he isn’t even saying anything and Jason Wu is rather effective as Aleke. His character could have easily have been annoying but he brings so much to the role that it works. However despite all these terrific elements, it isn’t a perfect film and it does have some flaws. Mostly it has to do with the script, which while well written for most part it does at times suffer from the same type of problems that usually come with most multi-character/story films. There were a couple times during the film’s story elements and character development became a bit contrived and forced. One of the major ones is the first 15 minutes, which was pretty muddled as the film jumps back and forth between different scenes that were happening either before and after Tama’s attack. It felt pretty jarring and off-putting at first, because of this it took me a few minutes to get into it (it happened a couple more times during the course of the film, while it does work at times but at other times it did become rather annoying and silly). Also the film’s narrative was pretty predictable and I could see where each of the character’s stories where going to go. Plus it didn’t help that some of the character’s stories didn’t really end in a satisfying way. Overall despite its script problems, MATARIKI is still a really good film that I quite liked a lot. While it isn’t the best film of its type that I’ve seen but for a film from a first time filmmaker, it’s pretty solid. Co-writer/director Michael Bennett definitely does have a lot of talent and I’ll be pretty interested to see what he comes up with next. 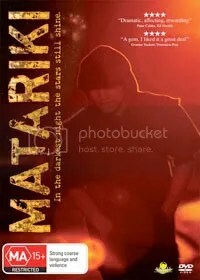 If you like New Zealand films or multi-character/story films, I can definitely say that MATARIKI is worth checking out. It won’t change your life but it’s a pretty good watch nonetheless. The DVD I reviewed was a screener, so I am unable to comment on Picture/Audio quality. Thanks to Bill at Gryphon Entertainment care of Arkles for the copy.